Up until 1935 the Palais de la Porte Doree was home to the Museum of Permanent Colonies then it changed to the Museum of France Overseas until the late 1950s, but by 1961 this exhibition venue and museum had turned into the Museum of Arts of Africa and Oceania. In 1990 it then became known Musee National des Arts d’Afrique et d’Oceanie, yet with the opening of the Musee Quai Branly, the collections were transferred to this new museum in Paris that opened in 2006. This meant that the only part remaining open to the public was the Palais de la Porte Doree Aquarium Tropical and the historical rooms of the ground floor. 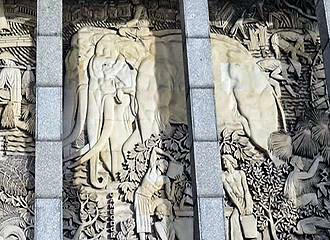 However, a redevelopment and renovation project was put in place, and since 2007 after having become classified as a historical monument in Paris twenty years prior, a new museum opened called the Cite Nationale de l’Histoire de l’Immigration, which is a museum dedicated to the History of Immigration in France. The Palais de la Porte Doree was designed by the architect Albert Laprade where he created a synthesis of Art Deco style combining French classical and Moroccan architecture that was freely inspired by the art colonies elements. 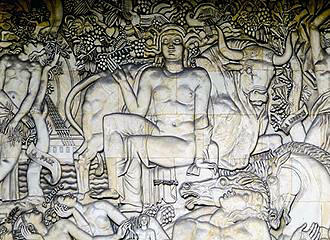 There were also numerous frescos that were produced for the inside of the palace along with bas-reliefs on the façade that were designed in order to illustrate the colonial International Exposition in Paris in 1931. However, as with any building, it will deteriorate over the years and a redevelopment plan along with restoration programme was put in place in the October of 2006 in order to bring the Palais de la Porte Doree back up to the required safety standards. 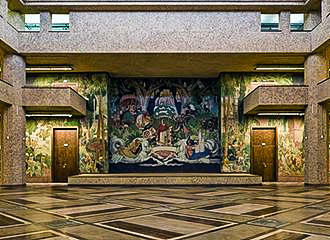 It also included the maintenance and restoration of the historical aspects of the building such as the impressive frescos and mosaics, yet also incorporated designing an area to accommodate the installation of the Cite Nationale de l’Histoire de l’Immigration museum. The Palace of the Golden Gate has also undergone major improvements for access to the disabled including designing new entrances and now a hall that had been closed to the public for quite some considerable time is the central space for the new museum, and this is linked to the hall that includes the entrance, cafe and bookstore. Yet innovations also prevail such as the utilisation of benches that can be closed to create additional floor space in this original hall, not forgetting that the galleries overlooking this forum or hall were reopened to allow for its original brightness, plus an auditorium was added along with a library. And even though the Palais de la Porte Doree was open during the major work undertaken between 2006 and 2011, another project was also put in place to create an entry suitable for people with reduced mobility and wheelchair users along with creating new light into the building. Plus the garden area was completely redesigned and replanted with a phenomenally wide variety of plants from many countries that were imported initially, whether intentional or not, such as the Polish that immigrated the horseradish plant to France. And this has all been instigated by the landscape architect and botanist, Liliana Motta that continued into 2013. So even though there are many modern elements to the Palais de la Porte Duree tourist attraction in Paris, there are also lots of historic features to discover, not forgetting that you can still get to visit the Tropical Aquarium and the Cite Nationale de l’Histoire de l’Immigration. You will be pleased to know that the Palace of the Golden Gate is open on a Tuesday through to a Sunday from 10am, however during the weekdays it closes at 5.30pm and on weekends it closes at 7pm. 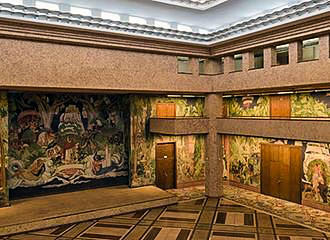 And providing you arrive a minimum of 45 minutes before closing time, you can access the Hall of Honour, the former Ballroom and the historical exhibitions completely free of charge. But to access the Tropical Aquarium or the Museum of the Immigration of France there is a charge. +33 (0) 1 49 15 98 98. 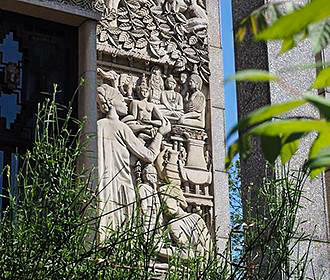 There are also workshops organised, such as one for keen gardeners and botanists, where you can discover more about the wide variety of plants that decorate the outside of the Golden Gate Palace. And when it comes to accessing the Palais de la Porte Doree via public transport in Paris, it is located in the 12th Arrondissement and the nearest metro station is the Porte Doree via line 8 or you have the bus numbered 46, and access to the disabled is via the entrance on Rue Armand Rousseau. It also close to Bercy and its Pavillions along with its different museums and the fabulous Parc de Bercy that also has a shopping village, so this are of the city is ideal for a day out when you are on holiday in Paris. 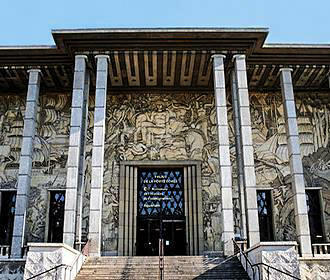 Home to the Museum of the History of Immigration in France and a tropical Aquarium, this building was first constructed for the 1931 International Exhibition and is now classed as an historical monument in Paris. The Palais de la Porte Doree translates to the Palace of the Golden Gate and was constructed for the colonial International Exhibition in 1931 with a main purpose of being a museum dedicated to colonial conquest of the territories and its impact on the arts. After the exhibition the palace changed its general assignments several times but the hall and reception rooms still bear witness to this past of Marshal Lyautey, who was the general curator of the exhibition, along with Paul Reynaud who was the minister of the colonies.